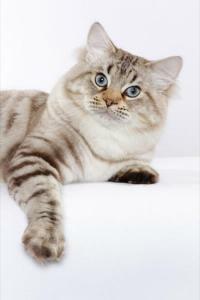 NACHREL American Bobtails is a small in-home Cattery. We proudly present our wonderful American Bobtail Kittens, bred with pride and integrity. We offer top quality, purebred, registered American Bobtail kittens in a variety of colors, primarily medium longhaired but sometimes medium shorthaired - Brown, Chocolate, Silver, Lilac, Blue, Lynx Point, Mink, Sepia, and Tabby. Our cats and kittens are a part of our family, receiving lots of love and attention. Kittens are guaranteed healthy and fully socialized. We are CFA Environmentally Approved and a participant in the TICA Voluntary Responsible Breeder Program, operating a secure, safe, healthy and clean Cattery ensuring that our adult cats and our kittens are provided an excellent home.